You are on space 10 of the Emperor track or higher. You have played at least 6 Staff cards. You have at least 12 Room tiles on your Hotel board. All rooms in at least 2 rows of your Hotel board are occupied. All rooms in at least 2 columns of your Hotel board are occupied. All rooms in at least 6 groups of rooms on your Hotel board are occupied. All rooms of one color are occupied on your Hotel board. You have at least 3 occupied rooms of each color. You have at least 4 red and 3 yellow occupied rooms. You have at least 4 yellow and at least 3 blue occupied rooms. You have at least 4 blue and 3 red occupied rooms. You have a question for the Staff? I am gladly at your service. I would like to explain each and every Staff member in detail: I will also tell you when each Staff member activates and how much you have to pay for their services. Some activate only once, namely when you hire them, i.e. when you play the Staff card. Others activate once per round. You decide when that is, but once they have done their jobs, they take a nap for the rest of the round (meaning you should turn them face down). You can use them again next round. There are also quite busy Staff who work permanently. Their effects last for the rest of the game. Finally, there are Staff that only come into effect at the end of the game providing Victory Points. Pool Attendant / Bademeister (1 krone, one-time): Advance 3 spaces on the Emperor track. Barista / Barista (3 krones, one-time): You receive 4 coffee. Barmann / Barkeeper (4 krones, once per round): You receive 1 wine. 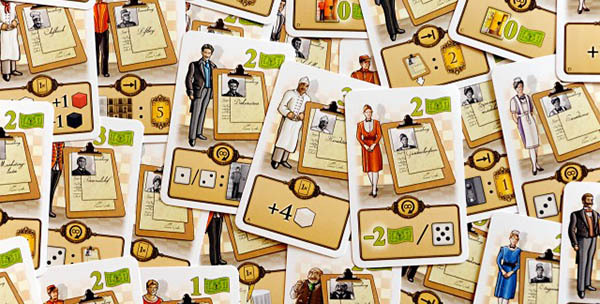 Bote / Delivery Boy (6 krones, permanent): You can take guests from the game board at no cost. Butler / Butler (5 krones, permanent): You can prepare blue rooms at no cost. Chauffeur / Chauffeur (5 krones, permanent): You can prepare red rooms at no cost. Chefkoch / Chef (3 krones, one-time): You receive 1 strudel, 1 cake, 1 wine, and 1 coffee. Concierge / Concierge (4 krones, game end): You receive 3 VP per occupied blue room. Dekorateur / Decorator (2 krones, permanent): Each time you take a die showing "1" or "2", you can also prepare 1 room. Direktionsassistent / Assistant Manager (4 krones, game end): You receive 4 VP per Staff card you played, including the Assistant Manager, of course. Direktor / Hotel Manager (4 krones, game end): You receive 4 VP for each set of 3 occupied rooms of different colors. Each room can only be part of one set. Example: At the end of the game, you have 3 red, 4 blue, and 6 yellow rooms, which are all occupied. You receive 3x4=12 VP. Empfangschef / Reception Clerk (4 krones, game end): You receive 3 VP per occupied yellow room. Etagendame / Female Floor Housekeeper (2 krones, game end): You receive 5 VP for each fully occupied floor in your hotel. Etagendiener / Male Floor Housekeeper (5 krones, permanent): Each time you complete a guest's order, that consists of 4 dishes and drinks, you also receive 4 VP. You only receive those points when the guest moves to a room. You also receive the guest's printed VP. Floristin / Florist (5 krones, permanent): You can prepare yellow rooms at no cost. Fremdenfuhrer / Tour Guide (2 krones, permanent): Each time you complete a green guest's order, you also receive 2 VP. You only receive those points when the guest moves to a room. Fruhstuckskellner / Breakfast Server (4 krones, once per round): You receive 1 strudel. Garderobenfrau / Checker (2 krones, permanent): Each time you take a die showing "5", you also receive a discount of 2 krones. As usual: if the discount exceeds the cost, you do not receive any money. Gartner / Gardener (3 krones, permanent): Each time you receive the Emperor bonus, you also receive 5 VP. Hausdame / Executive Housekeeper (2 krones, permanent): Each time you take a die showing "3" or "4", you also receive 2 VP. Hausdetektiv / Detective (2 krones, permanent): Each time you take a die showing "5", you can also advance 2 spaces on the Emperor track. Hausverwalter / Custodian (5 krones, permanent): Each time a guest moves into a room, you also receive 1 krone. Innenarchitekt / Interior Architect (3 krones, permanent): Each time you take a die showing "3", you also receive 5 VP. Kaltmamsell / Larder Cook (2 krones, one-time): You receive 4 strudels. Kellnerin / Waitress (6 krones, once per round): You receive 1 cake. Konditor / Confectioner (3 krones, one-time): You receive 4 cakes. Kuchenhilfe / Kitchen Hand (3 krones, permanent): You can take a die showing "6" at no cost. You get also the reward for the number of dice in Action space "6" plus one. Liftboy / Liftboy (4 krones, game end): You receive 5 VP for each fully occupied column in your hotel. Marketingleiter / Marketing Director (2 krones, game end): You receive 5 VP for each Politics card on which you placed a wooden disk. Masseurin / Masseuse (1 krone, permanent): Each time you complete a yellow guest's order, you also receive 1 krone. You only receive that krone when the guest moves to a room. Oberkellner / Chief Waiter (1 krone, permanent): You can move dishes and drinks from your Kitchen to your guests at no cost. Page / Page-boy (2 Krones; one-time): You can turn 2 rooms of any color to the other side, marking it occupied. Personalchef / Staff Manager (3 krones, permanent): Each time you take a die showing "3", you can also play a Staff card from your hand. Pferdeknecht / Groom (4 krones, permanent): Each time you complete a red guest's order, you also receive 2 krones. Portier / Porter (5 krones, one-time): Complete a guest's order by taking the dishes and drinks from the general supply. Reservierungsleiter / Booking Manager (4 krones, game end): You receive 3 VP per occupied red room. Restaurantchef / Restaurant Manager (2 krones, permanent): Each time you take a die showing "1" or "2", you also receive 1 additional dish and drink, respectively. The normal rules apply: you cannot take more cake than strudel, or more coffee than wine. Rezeptionist / Receptionist (5 krones, game end): You receive 1 VP per room in your hotel, regardless of whether or not the room is occupied, or merely prepared. Schuhputzer / Bootblack (4 krones, permanent): Each time you take a die showing "4", you advance 1 space on the Emperor track and on your money track for each die, instead of chosing one of the two options. Sekretarin / Secretary (5 krones, game end): You can copy another player's Staff card. Of course, you should copy a card providing VP-nothing else makes sense. Sommelier / Sommelier (2 krones, one-time): You receive 4 wine. Sous Chef / Sous-Chef (6 krones, once per round): You receive 1 coffee. Stallmeister / Stableman (1 krone, permanent): Each time you complete a blue guest's order, you can also advance 1 space on the Emperor track. Telefonistin / Operator (3 krones, game end): You receive VP for your position on the Emperor track. You receive twice the depicted value in VP. So you can get at most 12 VP from this, since your wooden disk can be at most on space 6 after the final Emperor scoring. Veranstaltungsleiter / Conference Manager (5 krones, permanent): You do not suffer the penalty for being on "0" on the Emperor track. Wascherin / Laundress (2 krones, permanent): Each time you take a die showing "4", you also receive 4 VP. Zimmerdiener / Room Service (3 krones, game end): You receive 2 VP for each fully occupied group of rooms in your hotel. The rooms must be occupied, it does not suffice to merely prepare them. Zimmermadchen / Chambermaid (4 krones, game end): You receive 1 VP per occupied room in your hotel. Bildhauer: You can prepare a room in the first or second row of your Hotel board at no cost. If you cannot do so: tough luck! Reichsritter: The only guest with no reward. What a greedy odd fellow. At least he is worth an easy 3 VP. E. Gizia: You receive another turn without taking dice.